By Luis Bueno – RIVERSIDE, CA (Jul 11, 2018) US Soccer Players - The World Cup offered MLS teams a bit of downtime. A couple of weekends without league matches meant teams could focus on sorting out their issues, helping new players get acclimated to their teams, and work on getting ready for the summer and a push toward the playoffs. For the LA Galaxy and LAFC, the break also meant sending some players to the other side of the planet to compete in the world’s greatest sporting spectacle. Now that the World Cup is nearing its culmination, the World Cup break long gone and players rejoining the LA teams, the squads have come out of the break alive. For the LA teams, the future is looking quite bright. 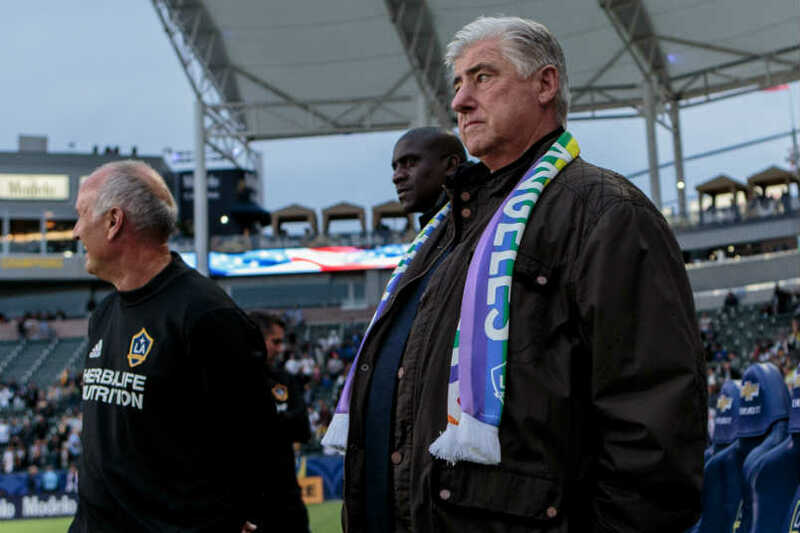 Based on recent results, the World Cup break could have been the best thing to happen for the LA Galaxy while the break has only reaffirmed and helped reinvigorate LAFC. Both teams are now heading in the right direction, poised for a legitimate playoff run, and perhaps more. At around the same time some 10 miles apart last weekend, the Galaxy and LAFC were each in the process of steamrolling an Eastern Conference foe. The Galaxy routed Columbus by 4-0, spoiling Gyasi Zardes’ return to StubHub Center, while LAFC ran up the score on visiting Orlando City SC, winning by a 4-1 margin. Each game was the first with returning World Cup players for both sides. The players’ absences may have helped the teams get better. Now that they have returned, the teams may be better off because of it. Much to the dismay of some LA Galaxy fans, the Dos Santos brothers returned earlier than expected from their World Cup participation. Brazil did the LA Galaxy (and LAFC) a favor by knocking Mexico out with a 2-0 win over El Tri on July 2. While Giovani and Jonathan Dos Santos did not play on the field at the same time in Russia, the two started the Galaxy’s match against the Crew on Saturday. Jonathan did a superb job in the defensive midfield for 90 minutes. Giovani meanwhile did not stand out as much in his 82 minutes. The Galaxy’s win was its first since June 9, but the Galaxy has not lost a league match since a 3-2 loss to FC Dallas on May 30. In the club’s modest five-game unbeaten run, the Galaxy has opened the scoring in all of them. Only a poor defense has kept the Galaxy from taking more points and climbing to a higher spot in the Western Conference table. While the Galaxy still has an uninspiring defense record, it is not the worst in the Western Conference. The Galaxy has allowed 28 goals in 18 games, but now the club has a +3 goal differential, an improvement after having carried a negative mark for most of the season. Five Western Conference teams have allowed more goals than the Galaxy’s 28. Perhaps Jonathan Dos Santos is the key to helping the club continue to improve. Zlatan Ibrahimovic’s arrival gave the Galaxy star power and a player who can score in any game under any circumstances. Scoring goals alone will not win the club championships. Under Bruce Arena, the Galaxy was a tough-as-nails defensive side. For many of those years, it was defensive midfielder Juninho who helped break apart opponents’ attacks from the middle of the field. If Dos Santos can replicate that and give the Galaxy a strong defensive presence in the midfield, the Galaxy might be very dangerous. With the summer transfer window now officially open, rumors have the Galaxy in the market for talent. If the Galaxy can bring in a player to solidify the defense, whether it is another defensive-minded midfielder or some experience along the defensive line, the club should continue to gain stockpile points. That makes the idea of a chase for a sixth MLS Cup seem somewhat plausible. For LAFC meanwhile, Mexico’s loss to Brazil meant getting Carlos Vela back. The club also welcomed back Costa Rica’s Marcos Urena from World Cup duty. Injury has kept Egypt’s Omar Gaber out of the lineup. Without the attacking players, LAFC still had to keep pace and keep playing. The biggest beneficiary to that was Adama Diomande. The club’s prized Norwegian import, Diomande made his debut on May 26 and played eight minutes off the bench in a 1-1 draw against DC United that day. That match was Vela’s last before leaving for the World Cup. In LAFC’s first game without Vela, Diomande played 35 minutes off the bench and scored his first goal, the only tally in a 2-1 loss to FC Dallas on June 2. In the next four games without Vela, Diomande played 344 minutes and scored six goals, including the club’s first-ever hat trick. LAFC coach Bob Bradley eased Vela back into the lineup upon his return and gave Vela less than a half hour of playing time. Vela and Diamonde only played about 20 minutes on the field together, but that did not take away Diomande’s effectiveness. Diomande scored twice in the rout of Orlando City. With Diomande and fellow recent arrival Lee Nguyen getting more playing time, LAFC will only continue to grow stronger and more confident on the attack. LAFC has scored 41 goals, most in the west and second in MLS, one off of Atlanta United. Like Atlanta, LAFC seems to have a loaded arsenal and figure to use that to make a run at not only the conference title but at the Supporters’ Shield as well. The summer is long, though, and both the Galaxy and LAFC face plenty of challenges. The Galaxy travel to New England on the weekend, a tough task having to travel across the country, while LAFC welcome a Portland Timbers side that has not lost in its last 11 league matches. The way things are going for both LA clubs, though, those should be challenges the teams can meet and overcome on their way to more league success. Luis Bueno is a veteran soccer writer. Follow him on twitter @BuenoSoccer.